LinkedIn Giveaway #2 - Win 1,000 OROX (~$300)! 2. Like this post Cointorox on LinkedIn: "LinkedIn Giveaway #2 - Win 1,000 OROX (~$300)! Winners announced on DECEMBER 15, 2018 on our Telegram Group (https://t.me/cointorox). 3. Share this post Cointorox on LinkedIn: "LinkedIn Giveaway #2 - Win 1,000 OROX (~$300)! Winners announced on DECEMBER 15, 2018 on our Telegram Group (Telegram: Contact @cointorox). *Previous Twitter Account has been suspended for violating Twitter rules which include aggressive form of marketing - requesting follows, retweets, etc. As such, no airdrops or bounty campaigns will be further provided on Twitter. Previous airdrop campaign participants have all been noted & will be rewarded soon. We will be using this account until further news has been provided by Twitter. Until then, this will be the official account for Cointorox. Have you seen the DEMO page for the digital piggy-bank yet? 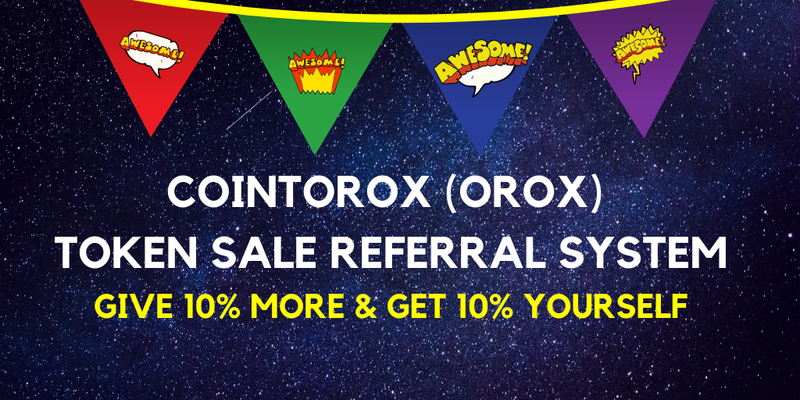 Cointorox Token Sale has a referral system whereby you can give 10% more & receive 10% of total ordered amounts. ERC Token Exchange is in its final stages of development! OROX holders can enjoy unlimited crypto withdrawals!